Find out why everyone is talking about this highly touted 2019 Toyota 4Runner. Window Grid Diversity Antenna, Variable Intermittent Wipers w/Heated Wiper Park, Valet Function, Trip Computer, Transmission: Electronic 5-Speed Automatic w/OD, Tailgate/Rear Door Lock Included w/Power Door Locks, Systems Monitor, Steel Spare Wheel, Side Impact Beams, Remote Keyless Entry w/Integrated Key Transmitter, 4 Door Curb/Courtesy, Illuminated Entry, Illuminated Ignition Switch and Panic Button. 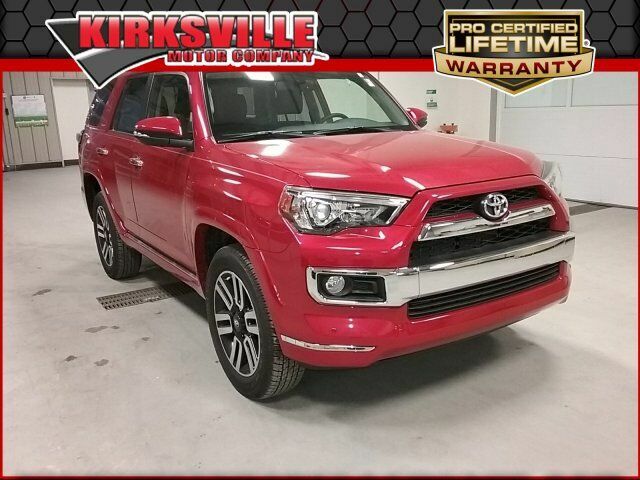 A short visit to Kirksville Motor Company located at 3607 N Baltimore St, Kirksville, MO 63501 can get you a reliable 4Runner today!